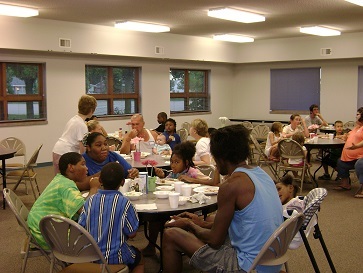 Family Promise of Greater Des Moines (FPGD) assists homeless families with children through a network of 14 area faith-based host congregations that provide clean, safe overnight shelter and nutritious meals for a period of one week every three months. The host congregations provide each family with a private room for sleeping as well as dinner and food for breakfast and for packing a sack lunch each day. Guests are provided a safe, secure place to be during the day at our Day Center, which is located at Westminster Presbyterian Church. Health care assessment and referrals through a partnership with Primary Health Care’s Homeless Outreach Program. Short-term child care assistance through a partnership with Iowa Homeless Youth Centers. Assistance organizing and executing a plan to secure employment or other income. Limited transportation assistance until a family secures income. Referrals for legal assistance through a partnership with Iowa Legal Aid. Initial length of stay is 30 days, but a family may stay for up to 90 days. Families wishing to stay longer than 30 days must agree to a plan to save 80% of their income and actively work toward goals related to securing income and housing.